UPDATE: Murfreesboro (Tenn.) Police announced they found the vehicle they believe to be involved: a Hyundai Santa Fe Crossover. Today, we have a tip from reader Rob R., who sent along a story from Murfreesboro, Tenn. about a gold SUV which left a 22-year-old cyclist with life-threatening injuries. Police there released "graphic video" of the incident hoping it leads to an arrest. "This is extremely crucial," said Major Clyde Adkison with the Murfreesboro Police Department. Detectives hope someone recognizes the gold SUV and provides helpful information. 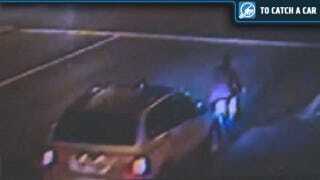 The video from red light cameras shows the SUV plowing into the back of the bicycle. The driver then leaves the cyclist, Donald Faulkner, in the road bleeding. "I don't see how they could not know. I don't know how you can hit a cyclist on a bicycle and not know they'd been hit," said Adkison. The video shows the driver of the SUV never slows and drives away as though nothing happened. Faulkner was taken by emergency medical helicopter to Vanderbilt Medical Center where he remains stable in intensive care. So, what's the car? We'll send word along to Adkison.